PSI -PATIENT SPECIFIC TOTAL KNEE ARTHROPLASTY | GEORGE D. GOUDELIS MD. Ph.D.
One of the most important developments in the history of orthopedics is the total replacement of the knee joint with special materials. The first surgery was in 1968 and until today the improvement of surgical techniques and materials are constantly upgrading its effectiveness. Today with the help of electronic technology and surgical expertise, the intervention of total knee arthroplasty changes page. 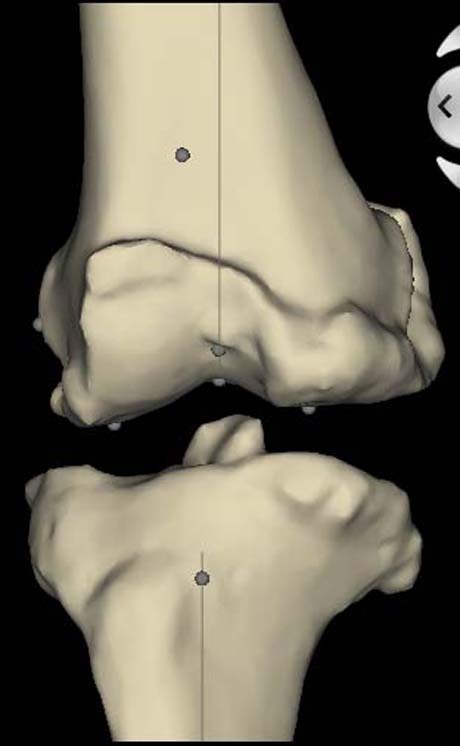 The new era of application to the patient individualized implant arthroplasty, gives the absolute harmonization of the materials to the specific anatomy of each human individual in need of replacement of the knee joint. 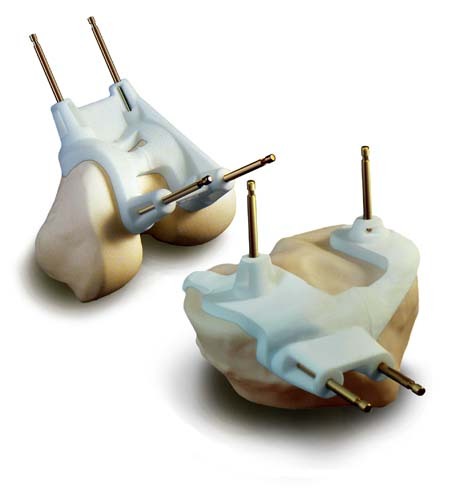 The personalized knee arthroplasty - Patient Specific Instrument PSI-, differs from the conventional method in that the implants will be placed in femur and tibia (knee), manufactured according to the anatomical peculiarities of the individual taking into consideration the specific slopes and turns having extended lower limb. To achieve this requires a process of study and creation of the implant by a qualified group of people starting from the specific Orthopaedic, their biomechanical scientists and finally special development centers and creation of implants in Switzerland. After clinical examination and study the radiographs by the skilled Orthopaedic, the patient makes CT three-point (knee, hip and ankle). 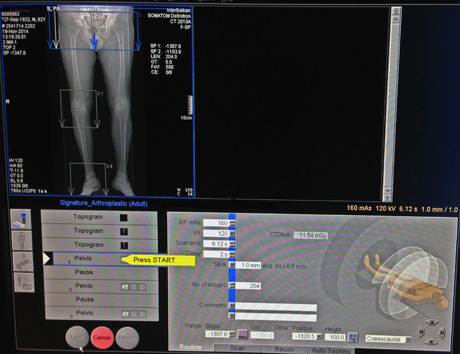 CT-scan hip-knee-ankle. Study of the affected lower limb as anatomical and mechanical unit. Then the tests are sent to a special center in Switzerland and qualified team of scientists with the help of cutting-edge electronic technology and in cooperation with the Orthopaedic Surgeon create the knee implants arthroplasty which can be applied in this patient only. The process takes four weeks. The implant is sent to the physician who will alert the patient to perform the surgery. 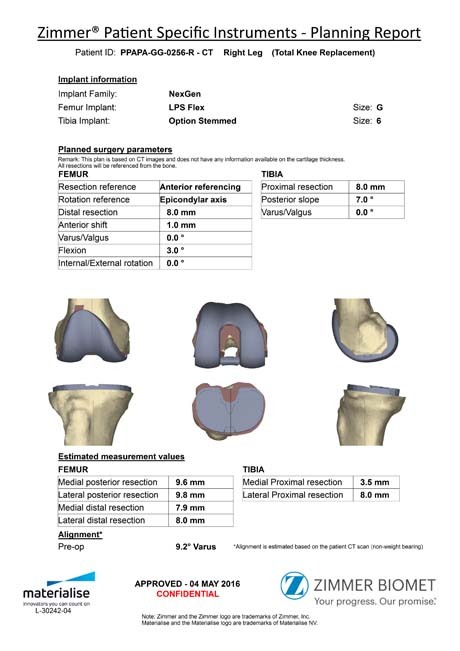 • The absolute measurement of the mechanical axis of the limb to CT and study of the peculiarities of the knee joint of each individual, as well as diversification of the knee according to gender (male or female knee), events that help build the ideal implant creating the conditions for the replacement to last longer. • A smaller incision, shorter operative time, less tissue trauma during surgery because of the special tools supplied with the implant. • Less blood loss which minimizes the need for postoperative transfusion. • Less time spent in hospital. • The full application of the implants in the patient's knee offers excellent mobility, faster recovery and a faster return to professional and daily obligations. 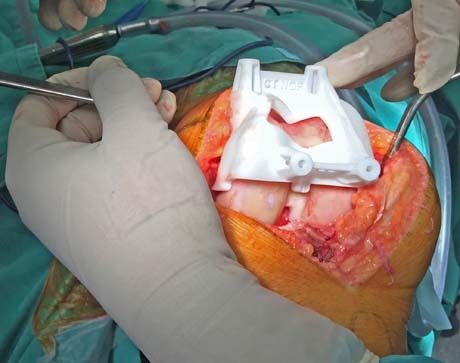 The study made in each joint separately before surgery is a step forward as compare to the surgical electronic navigation (navigator assisted surgery), or robotic assistance because the two previous methods carry out measurements of the knee during the surgery, which increasing the surgical time, but without can evaluate the lower limb as open plan anatomical unit to correct the mechanical axis of the lower limb as is the personalized knee arthroplasty (PSI). Modern technology combined with years of surgical experience and expertise to manage today opened a new era in understanding the replacement of affected joints with only aim to approach perfection. Interview is newspaper "TIPOS THESSALONIKIS": Patient Specific knee arthroplasty. 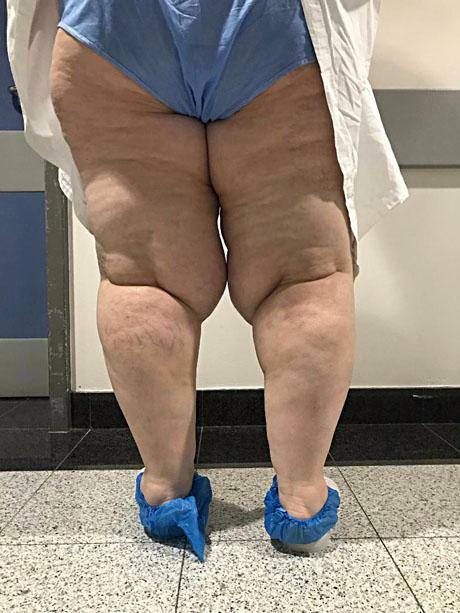 Female 73 years old and weight 122 kg suffering from severe osteoarthritis of the knee bilaterally. The large deformation of the legs combined with the intense knee pain create a big problem in the movement of women. After surgery PSI knee arthroplasty of the right knee (green line). 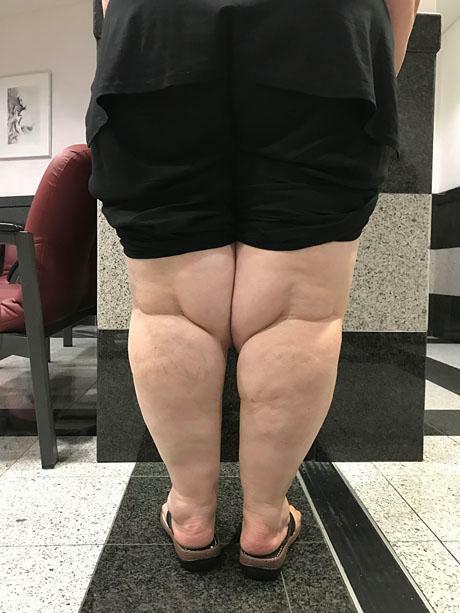 Female 58 years suffering from severe osteoarthritis of the knees bilaterally. 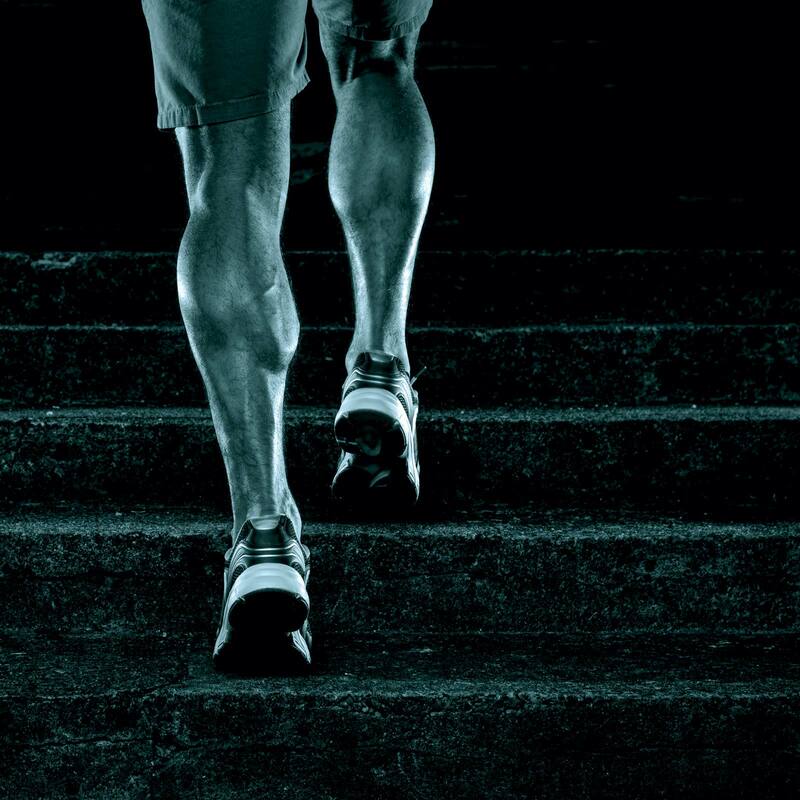 The patient because of severe pain in the knees limits the mobility and gradually changing the quality of life. She was decided to perform surgery with patient specific arthroplasty PSI in the left knee initially due to stronger symptoms. 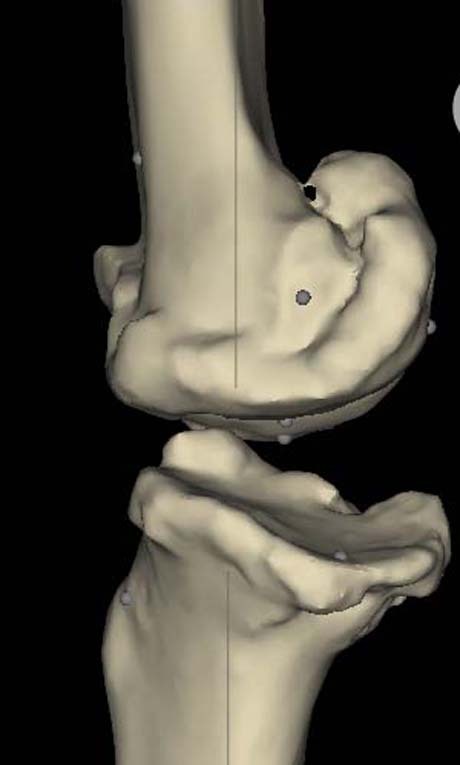 After three areas CT scan the process of three-dimensional electronic PSI creation of customized implants. 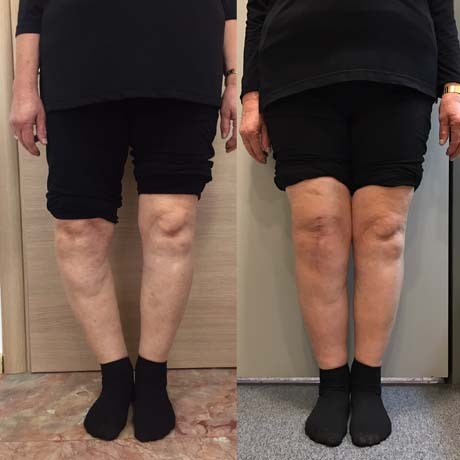 A patient 80 years with severe osteoarthritis of the knees bilateral which it causes severe pain when walking and during sleep. He was decided to operate with personalized knee replacement PSI (Patient Specific Instrument), initially his right knee. 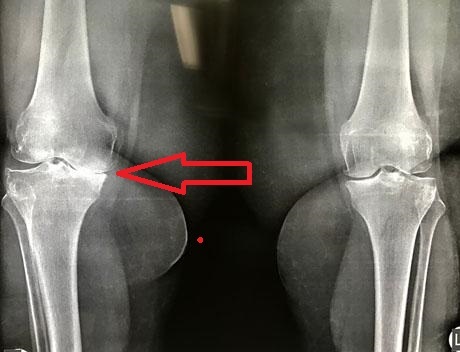 Female 70 years old suffering of osteoarthritis mostly in the right knee. She reports severe pain during walking and during rest and sleeping. The quality of life of the patient is affected because of pain of the right knee. 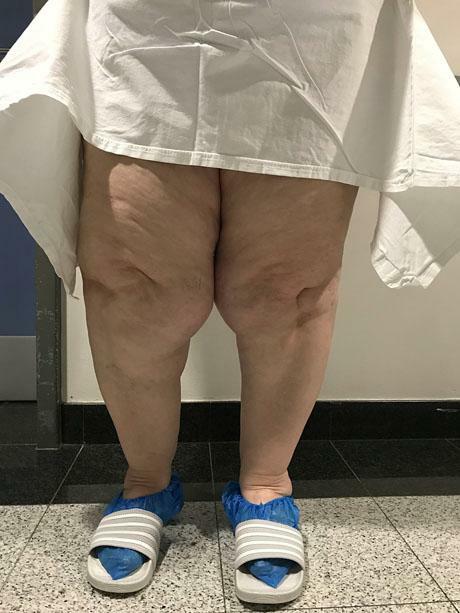 Female patient 64 years old suffering from severe pain in the knees which creates problems during gait and periods of rest of the extremities. 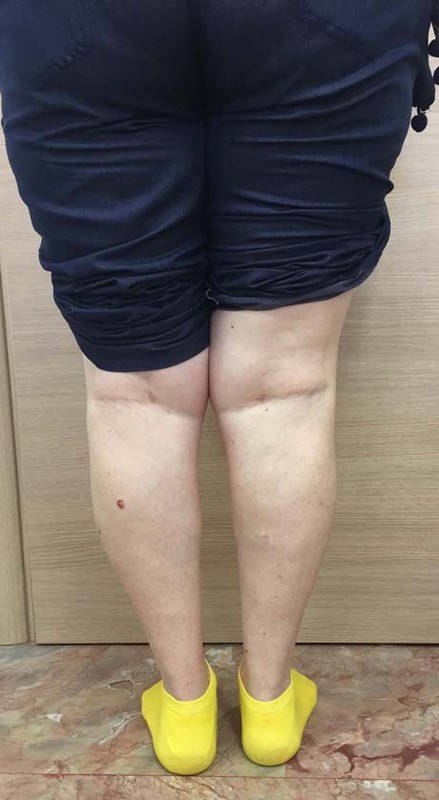 Female 68 years, suffering from severe osteoarthritis of the left knee which is in valgus deformity. The patient in addition to having a strong pain in the affected joint displays and operational problems in walking. 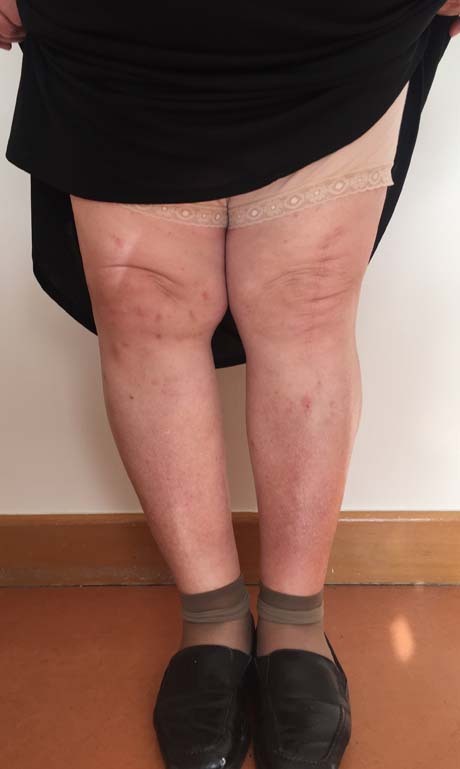 Female 61 years old with severe arthritis of the knee - degenerative osteoarthritis, which suffers from very intense pain in the right knee. The pain worsens with fatigue but lately shows pain and the period of rest and sleep. 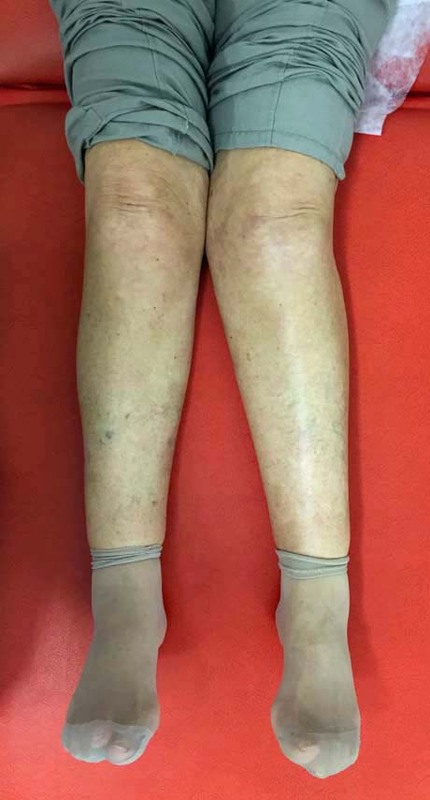 Female 72 years old suffers from severe arthritis of the knees bilateral. The left knee causing pain, creating special problems in patient with walking and sleeping. 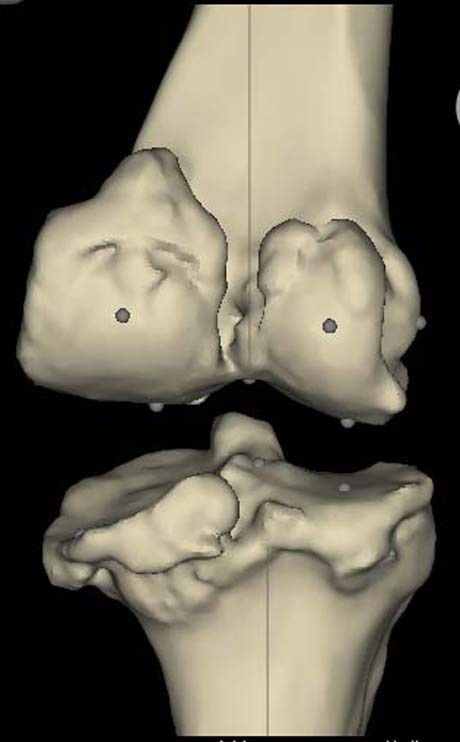 Female 73 years old suffering from advanced osteoarthritis in the knees but left knee is more severe. The knees have valgus deformity. 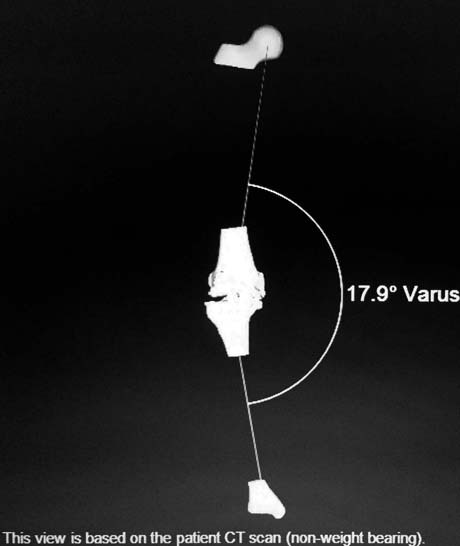 The left knee reach about 17 degrees of valgus, creating problems in walking and day living. The quality of gait has improved. 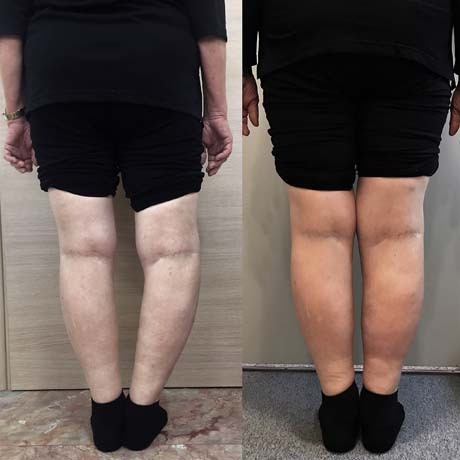 The patient declares absolutely satisfied with the result of Patient Specific Arthroplasty PSI firstly of not aching anymore at all and secondly that the lower limb has aligned by improving joint motion and walking.